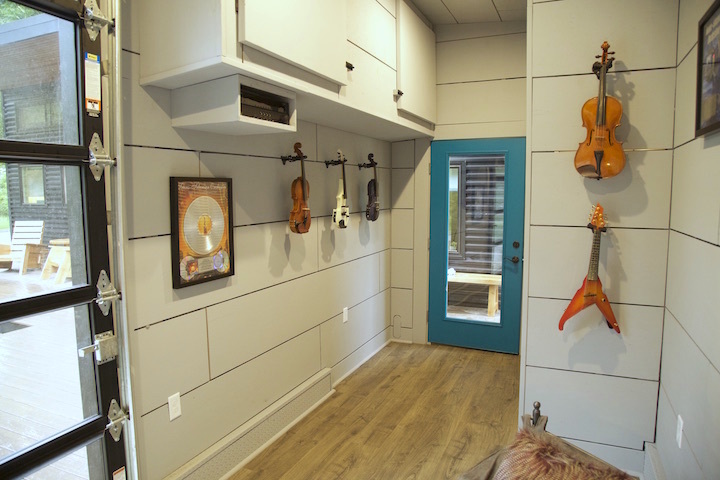 Zillow - "Rockin' Tiny Home"
Arkansas Living - "Built to Scale"
Country Living - "This Super Cool Tiny House is Actually a Working Amp"
Spray Foam Magazine - "A Sweet Duet"
GQ Magazine (Portugal) - "A Small House with an Enormous Amplifier"
Les Maison (French paper) - "A Rocker Built a Very Special Tiny House"
Banidea.com (Thai paper) - "One-storey House, Nice to Have Concert"
I never understood the need for Pinterest until I began the creation of my new tiny house. Now I can’t imagine my life without it. The process started on July 7, 2016. I applied to be on Tiny House Nation. They responded that they’d love to learn more about the tiny house I would like to build including where I would want to live. There are many places that I would want to live, but my top choice was Fayetteville, Arkansas. That may seem a bit random after having lived only in big cities – Boston, New York, LA, and Sydney. And while I realized that it would be a major change, my brother, his wife and my two little nephews live there. My brother also had land that we could start building on immediately. It all happened very fast. Between my schedule and the networks’ , we only had 2 months until The Big Reveal. From that point on it was GO! 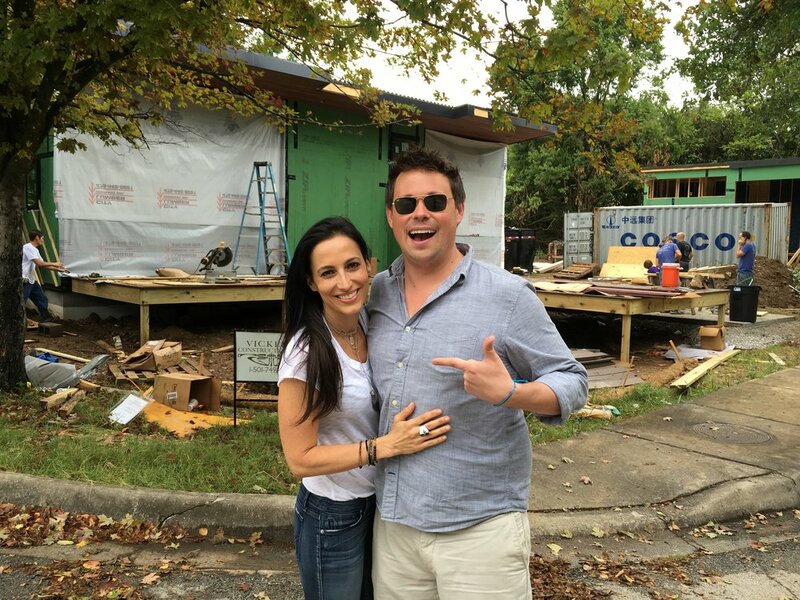 My brother-in-law, Stefan, who has a construction company in Little Rock (vickeryconstruction.com) was on board to help build the house with his team along with Zack, one of the hosts of Tiny House Nation. My brother, a contractor, owns a business in Fayetteville called 3Volve which builds eco-friendly housing while giving back to the community. He is familiar with permits and housing regulations in the area, so he would be a key player in helping this project move forward. Additionally, there were likely to be hiccups since this was the first tiny house built in the city. And many regulations are for larger houses. Where on the land do I want it positioned? Going back, I’ll take you through my process of getting to my final design. I begin searching Pinterest for Tiny House ideas. It is endless. I find a shipping container house that I completely fall in love with. My brother warns against it for a tight timeline. So does the show. Shipping containers are specialized material with a large learning curve and requires a builder with a lot of experience in that area. I decide against it. I have to decide quickly on the size of the house in order to move forward. 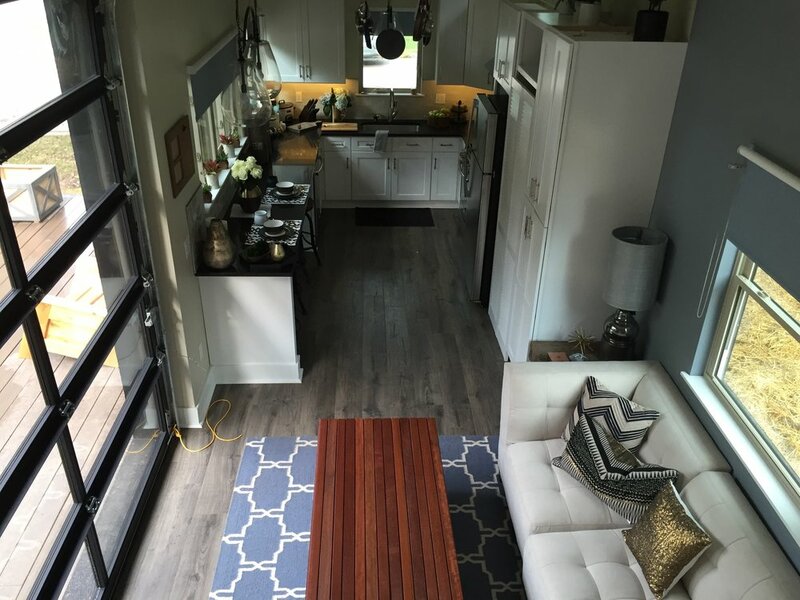 Most tiny houses on the show are 8’ wide. I decide on 10’ wide per Zack's recommendation. He says the extra 2 feet makes a huge difference. Someone else I speak to who does tiny houses recommends going with 40’ long instead of 32’. If I were planning on driving it around a lot, they would have recommended smaller. However, this is a house I want to live in long term and hopefully have a family in, not just a place to visit on weekends. The L shape is also recommended to me because it makes smaller spaces feel bigger. Part of me feels like I am cheating, since most of the houses I see on the show are less than 300 sq ft. But someone reminds me that while 400 sq ft plus 160’ is a lot for a tiny house, in reality it is quite small. 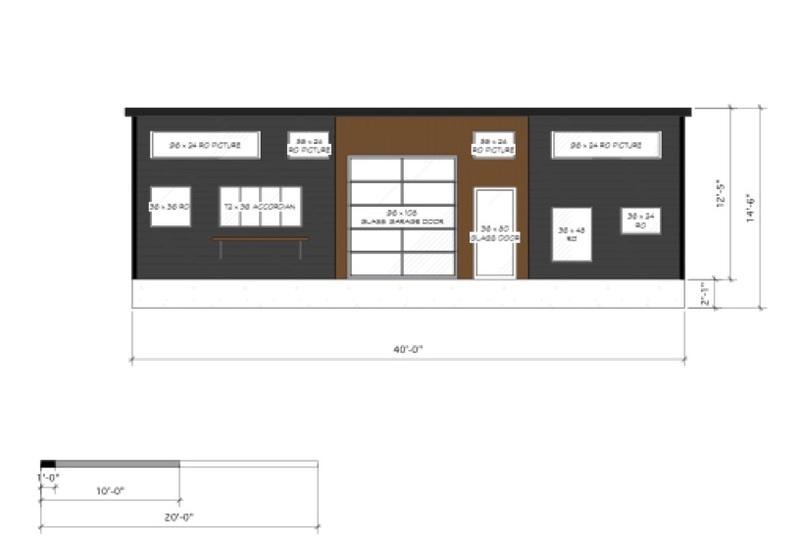 DECISION: Go with a 10’ wide, 40’ long house. Solid foundation for the main house instead of a trailer. Build the other structure on a 8’x20’ trailer so it is movable. My brother, Z, has tons of paperwork to fill out for the city before we can begin building. Today he asks what type of central air I will be using? I know nothing about house type things. But I am told that for tiny houses a mini split a/c unit chills a tiny house really well. I want to get my house LEED certified meaning it is resource efficient, uses less water and energy and reduces greenhouse gas emissions, while saving money. My brother says I don’t have nearly enough time to do this. DECISION: While it won’t be LEED certified, I will do as many things as possible that can make it more efficient. Z sends me a drawing of the “Plat of Survey” for my land. I have no idea what this means, other than I see a drawing of the plot of land with marks and lines cutting the property into different section. After looking up what it means, I find out that it is used to identify boundaries, roadways, and access rights of way. It is a legal description of the property and where you are allowed to build etc. The permit for my house needs to be filled out. I fill out as much as I can and Stefan does the rest. The architect and house designer at Tiny House Nation get back to me with an initial floor plan. We are working together on a daily basis. During our initial phone call he asks what I want in my house (I need stairs, normal bathroom size), what does it need overall to make me happy (lots of light! ), what style do I like (contemporary, modern, sleek), any special features (room to grow and a separate space to practice) And then, BAM, he comes back to me with a floor plan. It is absolutely perfect. Not only is he amazing at what he does, but he has kept me calm during this very stressful process. He is a total angel and I’m not sure how this would have happened without him. We set up a call between the city planning committee and the network. If the city is not on board, it will be almost impossible to push this plan through in time to build. Luckily they are excited about the project. The mayor now knows about it as well and may even have a cameo during the show. 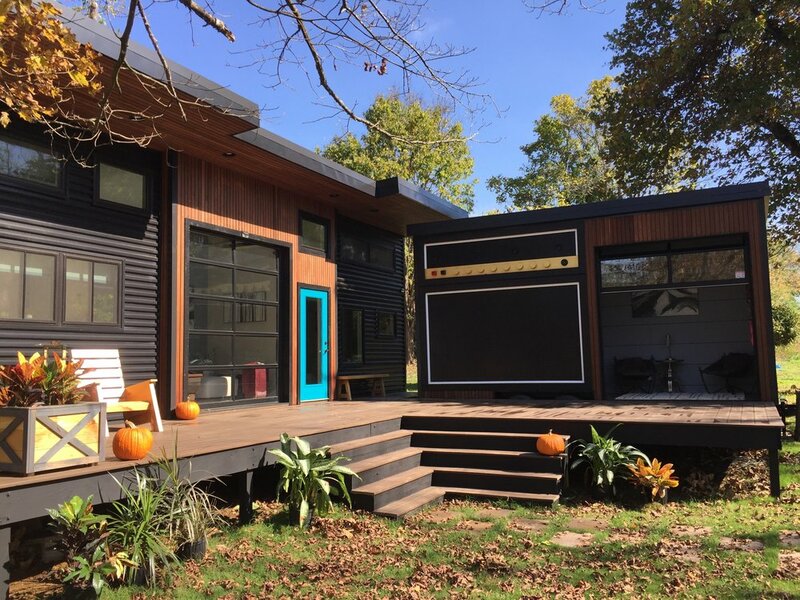 The city is hopeful that during filming time, the show can hold a panel meeting for the public to see what goes into permitting and building for tiny houses. Windows have to be ordered immediately or they won’t come in time. Especially because many are custom size. We find a place in Little Rock that will do them at 50% retail. The designer is able to send him all the window dimensions and they will begin working on them. Apparently windows are some of the things that take the longest and need to be pre-ordered so we are lucky they are able to do them in this short time frame. Z turns in the Plat of Survey of where my house will be located according to what is allowed. Lots of confusing markings and lines and numbers. But through all the markings, I see the outline of where my house will rest. And that is exciting. There are 3 plat plans – Erosion Control Plan, Grading Plan and Site Plan. This is all over my head and it makes me really happy that I am not a contractor. I feel like my brain would explode with all these zillions of details and regulations to conform to. Today the house designer sends me elevations. Before today I didn’t know what this meant. The elevation pictures show my house as I will see it from the outside. I see where the doors go, the windows, the color and style. Now I can actually see myself living in this house, where before it was all ideas. I get the budget from Stefan. It is EXPENSIVE. I thought tiny houses would be cheap. But they are not. It comes in at about $80,000. I had originally hoped for $60,000. But compared to other houses for $80,000, in the area which would be complete teardowns and without all of the things I wanted, this price is actually a deal. It is also 2 separate structures which definitely ups the price. I just have to keep reminding myself that I am creating my dream home! Z informs me I need to order a container to hold all of the supplies coming in – lumber, windows, etc. There is a place in Fayetteville that sells them and I get a used one from Cosco for $2200. I worry about this being a waste of money. What will I do with it in another month? Z thinks I should turn this into storage/vegan food truck/ art gallery for local artists once the building is complete. This makes me feel a bit better. So now the question is what kinds of material to use? We have decided on Abaco siding – a hard wood that doesn’t need to be treated and can withstand weather. I love the color of it and I love even more the fact that I won’t have to fix the wood once a year. It will stay nice looking forever. So while it is expensive in the beginning, it saves money longer term. Turns out we will need a forklift just to unload and remove the pallets because it is so heavy. And it is put together with hooks. 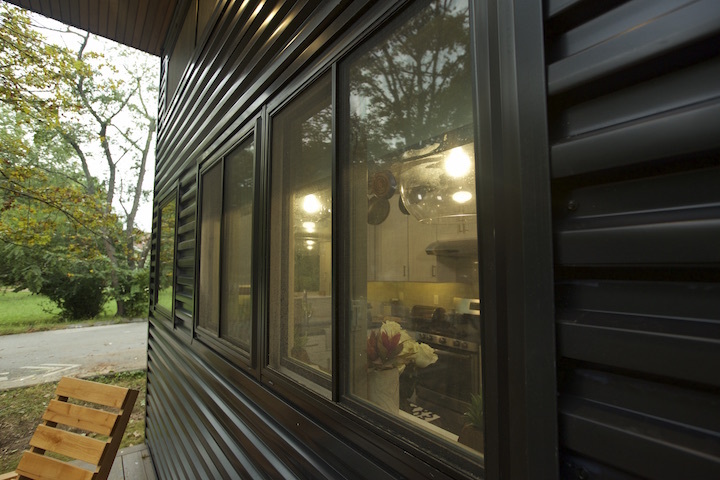 We have also decided on a black corrugated aluminum for the siding. Up until today I had no idea how many choices there were of corrugated aluminum. I like the “sinewave” and the “V-beam” which I have seen before. We end up going with the 4”box rib which the designer thinks will look kickass. I trust him. Below are just SOME of my choices. Today we get the layout for the deck (stage area). It’s huge! Almost as big as my tiny house. But I want this. My vision is to have concerts, jam sessions, drum circles and other entertainment on this deck, bringing locals in the area together and help build a community in this up and coming area. It’s now time to pick out materials for the deck. I assume we will go with wood. Nope! We will go with something that withstands weather and all kinds of other things, therefore less maintenance. There are many options but we go with Azek which has offers composite decking material rather than wood. Composite decking, I have just learned resists against scratches, insects, moisture, mildew and more. What I love about this is that it won’t start looking bad in a few years. I am looking into solar panels for the house. In order to get a price, the company needs to check out the land and where the house will be placed on land due to sun exposure as well as the direction it faces. The price comes back at $14,000! I will earn a $4,200 tax credit that I can use to offset federal taxes owed. This mean the system will have a final cost of $9,800. DECISION: No solar panels for now. My brother now tells me I need to have Home Energy Modeling done which is apparently a requirement in Fayetteville. This tests to see how efficient the house will be. This is an extra cost but a necessity. It seems like this is never-ending with the amount of forms and people that have to be involved. R-value tells us how well a particular construction material insulates. The higher the R-value, the greater the insulating power. Permit came back today and they need the section on Walls filled out. Below is a picture of what they need. This is way over my head, so I send it along to Stefan to fill out. I need to fill out a Homeowner Affadavit and submit the permit. Since my brother is local, I fill out the paperwork, send it to him and he takes it in to the office in person. It feels like this house is never going to get done. All of this paperwork needs to be complete before we even begin building! Totally overwhelming. Permit is complete and submitted! Now we have to wait for it to go through and have city approve it. A guy from the city who is responsible for sidewalks just let us know that I will need to put in 140 feet of sidewalk. This is absolutely ludicrous. First of all there is already sidewalk on one corner of the property that is totally fine. Second of all, that is usually the city responsibility. I am trying to practice Ho’oponopono on him (an ancient Hawaiian healing technique of reconciliation and forgiveness) where it teaches that we are all connected. And even if you don’t know the person, you start saying, “I love you, I’m sorry, Please forgive me, Thank you” to them. It seems crazy but I would rather not hold on to this anger. It makes me feel slightly better after I try to be compassionate towards this man whom I’ve never met. Release the anger. There are way more things to think about than this guy. Still waiting. My friend told me that the beginning and ending of projects are always the hardest. The middle flies by. But getting everything on track and organized takes time. Hoping he’s right. My 8-year old nephew has decided to start a blog on the progress of my house. Since he is down the street from the build he will be checking on it for any “mistakes” as he puts it. Glad to have someone there for me. I might be paying him to be my property manager. Today the surveyors came to mark up the property of where the tiny house will go. It’s getting close. The Trailer arrived today after being built and shipped from Colorado. Cabinets are ordered. Tiles are ordered. 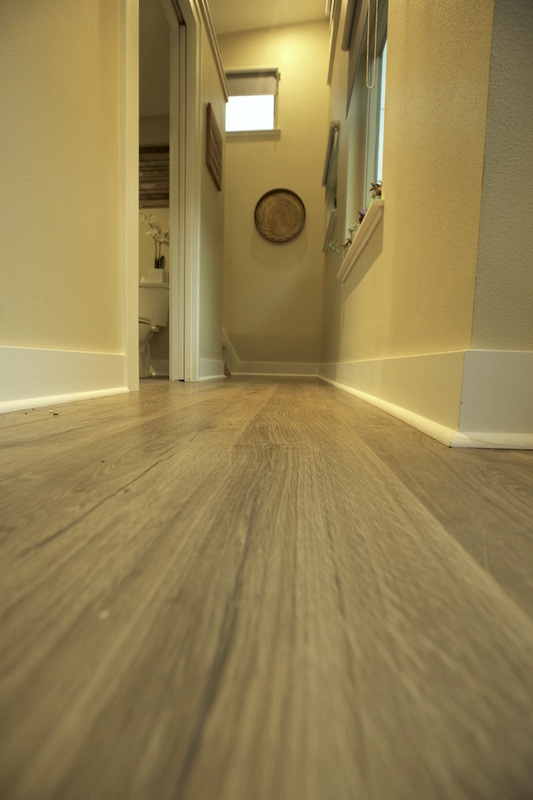 Flooring is ordered. The show designers are working together to pick out items that might work best. They run a few ideas by me in terms of color and style – I choose a couple I like and the rest will be a surprise! Things are coming together. The expenses are endless. I need a portapotty for the workers. I need builder’s insurance in case anything happens during the build. I will need to pay for the energy modeling for the house. I had no idea how many things went into building a house. And it’s probably a good thing because I would have been way too overwhelmed. Fortunately for many people building tiny homes, they don’t need to deal with many of these things because their houses will be on a trailer. We only have to go through all of this because of the solid foundation! My brother turns in the revised permit. Normally this wouldn’t be such an issue, except that when my brother turns it in at the office, it is extremely busy. The inspectors are getting permits for all of the University students to move into their apartments before school starts on August 22nd. The apartments applied before we did, so theirs takes priority. It rained all day, so the crew is concerned that the ground won’t be dry enough when we do get the permit to put in foundation. I’m very concerned this is not going to get done in time. Except that it’s raining so building actually can’t commence. Good news is that the soundproof insulation from SoundCow has arrived. I don’t know how this happened, but the PERMIT IS READY!!! Building can commence. Best day so far! Stefan has driven to Arkansas to begin building tomorrow. Below is a picture of the permit! 1st problem: Stefan’s truck didn’t start this morning so they can’t get all the tools to the site. There is no power at the site yet so they have to find a generator to borrow to run power tools. But Tidy Excavation shows up to dig trenches for the foundation footings. Tidy Excavation has never done such a small job before – they are used to doing full size houses. Concrete footings will go underground to support the cinderblock foundation. They use a laser level to measure the elevation difference between the street and the lot so we know how deep to dig the trench. This tells us how many rows of cinderblocks we will need to get the house above the street level to avoid any possible flooding. Rebar was supposed to go into the trenches this evening. In the morning, we hope to get a quick inspection and pour concrete over the rebar to complete the footings. The crew begins building the trailer. I didn’t realize how tall it would be. Way higher than the shipping container! Cinder blocks are getting put in over the foundation for the main house. Today is Saturday and the crew heads back home to Little Rock to see their families. I have booked my ticket out to Arkansas for September 2 – 22. Other issues that came up – the washer and dryer will stick out too far from the wall. I guess I can eventually get smaller ones. I went with these because my brother had extras for me. Apparently need to make sure that fridge is not next to stove and neither is the washer dryer in final plans. Blackout shades are ordered from blinds.com! Getting some light purple for the trailer and a grey for the main house. Bought builder’s insurance $525 for a $100,000 house. Doesn’t seem too bad and Z definitely thought it was a necessity. Electrician is supposed to come today but he left a message last night that he is in the emergency room. Z finds another one and he will do it be there tomorrow. I have to let city know to pull that permit and get another one (since I am the permit holder). Find out today that the Murphy bunkbed we ordered is 3” too long for the wall. Inspector comes tomorrow and the plan is for spray foam to be installed the following day. Unfortunately the installers are not available. Not sure if this means they can come Saturday or Monday. Either way it will put build back at least 1-3 days. Z wants to find another installer. Why did I choose spray foam insulation? I did a lot of research before building the tiny house and many people recommended spray foam. It’s more insulation for less space. And in a tiny house where space is a huge commodity, the less space the insulation takes up, the better. We are also on a quick timeline and turnaround for the build. Spray foam is much quicker to put in and much less messy. It also lasts indefinitely compared to regular insulation. I have found out through the building process there is a greater “R” value for less space and you end up saving on energy costs over time! Had an exchange of emails today with Azek, the decking company and they are going to be “picture framing” the deck. I am not sure what that means, so I look it up and find this video online. It truly is putting a frame around the deck. Question of the Day: Where to put the driveway. We need 18’ driveway by law. We need to decide which side of the house to put it on. The problem is that the place it is most suited for has a power pole right in the way. DECISION: Put next to power pole anyway, though in a more inconvenient place to the house. Eventually may have to move it depending on if we split up the land in back of it for more builds. Z calls me today and doesn’t think they will be able to get the mattress up the stairs. Not enough room. I ask if they can fit it over the ledge of the loft on the living room side. He is not sure but calls me back a couple hours later saying we are good on the mattress. So many things that come up that you’d never even think about. Inspection of the house today and it PASSES!! Great news. Bad news is that it rained and the insulation got ruined in the trailer portion. Close cell foam is finished today for ceilings (R-38) and walls (R-13). Floor insulation (r-9) in closed cell and sheetrock will be done in morning. Need them to come and inspect for HERS rating portion tomorrow. I have no idea how much things cost…I realized decking and siding would be expensive, but didn’t even think about lumber for framing the house, deck support etc. It comes in over $10,000. Insulation company didn’t clean foam excess from walls yesterday (long day) so drywallers are postponing starting until tomorrow. Energy rater recommends a hood vent that vents to outside because the house will be so air tight. Also we may need a 30 CFM (cubic feet per minute) vent as bathroom fan that is on a timer, so there will be continuous fresh air coming in. Sheet metal arrives late tonight/early tomorrow. Forgot/ didn’t know to ask them about sending matching screws, J-channels that match color, and cutting pieces in the correct size to match windows. Z calls me today that it’s going to take an extraordinary amount of time for Stefan and his crew to do and be extremely expensive. I ask my friend who works in construction about all of this. He says Lowe’s can color match the J channels if you bring in a sample. Also a sheet metal worker can make J-channels in 30 minutes. It’s sheet metal 101. Screws will have to be painted the correct color. QUESTION: What are J-Channels? J-channel provides protection from water and creates an attractive trim for windows. Drywall Tape and mud, deck framing and metal roofing and siding are delivered. Stefan calls to tell me that Abaco wood has still not arrived. They need it immediately to begin building. It has arrived in Little Rock on Wednesday but hasn’t been delivered because it needed approval for a liftgate. If I hadn’t called it would be sitting there indefinitely. I realize I need to stay on top of things in this whole building process or things get overlooked. Question: What is a liftgate? I look up “lift gate.” The wood is apparently so heavy that they need either a truck with a lift gate or a forklift to get it off truck. I give approval for a truck with a liftgate. They promise it will be delivered Monday. Finally headed to Arkansas to get ready for filming next week. Abaco hasn’t been delivered. Tracked it and it is in Little Rock not being sent because it needs a sign off on a lift gate since it is heavy and in a residential neighborhood. Call shipping company. They can’t find any of my things shipped from NYC which were expedited to make sure they arrive in time for the show. Over $50,000 worth of instruments and equipment. The tracking number is incorrect and they have no idea where it is. Needs to be delivered by filming since a large part of the story is about my instruments. Z and I go over to Nee and Rob’s yoga/drum circle and join in the Friday night festivities. Z and I head to Hot Springs to Gina’s house for the weekend. The boys are already there. Z is finally able to get a bit of a break from working. Stefan and his crew also take a break before all the filming begins next week. Shipping company still can’t find my shipping crate. This is an exercise in letting go of attachment. If it is gone for good, then I have to be ok with that. So I have let my anxiety and worry go. The show can work around it and hopefully whoever gets my luggage will enjoy my instruments. Labor Day. Head back to Fayetteville. Seems like so many things to get done before the film crew arrives on Friday. Filming begins Saturday. Abaco has not arrived. It is still in Little Rock. Company says they won’t deliver it because we need approval for liftgate. I remind them of my conversation on Friday. There is no record of the phone call. They say they can deliver Thursday if we have a forklift. I say this is impossible and I need it tomorrow or they will not be able to get the house done in time. After 3 hours on the phone back and forth with the delivery company, wood company and another shipping company, they find a truck with liftgate and promise is can be delivered tomorrow. Abaco wood finally arrives. It is the wrong size. It is supposed to be 5/4 board. It is a third that size. It is also way more difficult to install than Stefan had originally planned. It will take 3x the amount of time than originally planned because of the thing planks. Because it is such thick wood, it can not be drilled into or it will split. Instead they need to use clips which is extremely time intensive. Not to mention that most of Stefan’s crew has never used the clip system before. Stefan is worried the house will not be done in time. I head to Ecovet at 9am to check out the showroom. Ecovet is an incredible company that employs vets and build furniture with reclaimed wood from old trailers. It is beyond what I could have hoped for. I interview 3 vets and Mike, the owner. The furniture is so big and beautiful that it makes me want a huge house to fit it all in. Mike shows me the outdoor furniture they have made me and I am in love. The furniture is made from reclaimed wood from Walmart trailers. I call the network to ask if we can do a field trip here because people need to see this place and be aware of what they are doing. The vets all say that this company is their family. When they come back from serving the country, they feel lost. Ecovet gives them a skill and a family and people who understand them. The Network is excited to work with them. The sheet metal workers are not working. Every time I go over to the house they are sitting around next to their trucks. The head guy had to leave for an emergency and the rest don’t know how to put the metal on the house. I call every other sheet metal person in town. I go to Howse furniture in Bentonville to look at the furniture for my tiny home. The furniture is gorgeous and I can’t wait to see what it looks like in my new home. I go over my favorite pieces with Leslie, the owner of Howse. Allegra, the show designer, will come by and choose the final pieces when she arrives in town on Monday. Stefan is worried – the garage door in the trailer is 9 feet high. The trailer is only 8 feet wide. Will it get jammed when raised? We haven’t thought of this. I don’t tell Crabby. We will figure it out when he gets here. Abaco will not work for bathroom shower floor because there are no holes for water to go thru. I panic and run to Townzen tiles. The man there is super sweet and matches the other two tiles I already have with brown cabinets and gives me all the tiles for free! Finally I hear back from a sheet metal guy. He thinks he can help. The other guys have stopped showing up anyway, so I am happy not to be be paying people for not working. Becky from Citiscapes Magazine comes by the tiny house to do an interview for her magazine. They are hoping to feature the house in the Feb/March Home issue (around the time of the show airing). The house is up, but there is still a lot to do. Stefan says he is a it nervous it will get done in time, but he thinks it can be “show” ready. Somehow the shipping company has tracked my crate and it is delivered today. Relief. I hug my instruments when I get them. They are like my babies. Kori, the story producer from the network, has arrived and we go to Crystal Bridges to go over the schedule for next week. Ryan doesn’t arrive until tomorrow because he has to be at an event in Boulder. The original address of my house is 612. The gas company comes today and will not install it under that address because the main house is facing another street. They change my address to 344. Attachment issues arise again. I realize I have become attached to the number 612. I meet a bunch of the crew and it is like I have known them forever. Brenton is the Executive Producer of the show. I meet Calvin, Brian Crabb, Gavin, the DP. Zack comes tomorrow and John comes on Monday because of his son’s bday. In the morning Gustavo and his crew put down a driveway which is required by the city. The trailer will sit on top of this. They allot a tiny place in the corner for me to a permanent mark in the cement. I draw the state of Arkansas and write A+R in the center. Asha, Ryan and also the state abbreviation. Ryan arrives at 3pm. We drive straight to Z and Gina’s to begin filming interviews in the backyard of their house. How did we meet? What do we think about moving to Arkansas? Why do we want to go tiny? Why have we never lived together? The interview lasts for several hours. They get B roll of us playing with my nephews Edmond and Clayton on the trampoline, slackline and playing baseball. Edmond is excited to be on TV. Trucks and camera crews line the small streets bordering the house. Curious onlookers come by and wonder at what is being built. There are at least 40 people at any given time working on the house – from the TV crew, to Stefan’s builders to installers. The Abaco sections on the house are grueling for Stefan and the workers. For 3 feet of siding, it takes the crew over 4 hours. They will not finish this for the show. Today we meet John on set at the building site. He takes us on a tour of how the house looks now. They still have a lot of work and it is hard to tell what the final house will actually look like. I am upset when I see the “stairs” to the loft. There are none. That is one of my requirements. Zack explains that due to city codes and tiny houses, stairs are not allowed. Instead they have built alternating treads which are difficult and awkward to ascend. The loft looks teeny and the there is not much headroom. I rethink many of the designs. Because this all happened so quickly and we had to get plans into the city, we had to make in the moment decisions about things. If I had to do it over again, we could have made the ceiling in loft normal height since it is on foundation. But when we initially turned it in, we thought it would be on a trailer. Maximum trailer height is 13 feet. John comes over to Z and Gina’s house to interview us on what we want in our house and what we expect with living tiny. He wonders how living in a 400 sq ft space will work when Ryan tries to edit and I am playing music. Will Ryan be able to concentrate? Later in the day, John brings us to the house for a “challenge.” He has brought the local African drum group/dancers over to the house. There are about 20 of them. We spread out in the living room and kitchen while Ryan tries to edit upstairs. There is massive amount of noise and John pulls me into the center to dance. I have already told Kori I refuse to dance on TV but Gavin, the DP, pushes me out onto the floor. Eventually Ryan comes down and dances in the middle of the drum circle. There is no ac in the house yet, it is about 90 degrees outside and we are all sweating profusely. The network loves the group and we have so much fun playing together. I hope that I will get involved more with them when I get settled in. This will be the last time we see the house until reveal day on Thursday. Usually the network films for 7 days but John had to come late and Zack has to leave a day early so we only have 4 days of full filming available. I decide on a bright teal door for some color. The crew tries to do as much filming without Zack and John as possible. Garage doors have still not arrived. Stefan and the crew need them immediately to start building around it. First thing in the morning, they film us doing “hero” shots. We go to a beautiful place near a bridge on the bike path near Rogers. There is no talking, just trying to look “pretty” for the cameras. It is awkward and funny. “Look at each other, smile, laugh, now look at the camera. Now look back at each other.” We do this over and over and over until they think they have it. We then go to Ecovet for a field trip where we speak to Mike about his company and his furniture. We get some extra reclaimed wood that will be used for my “secret/surprise” project for Ryan. They want to film me and Ryan at the house again. This time they get me playing music/practicing and film Ryan editing his videos. Then they get some B roll of us riding bikes together. Probably most of this won’t even actually make it onto the show. I check on the window blinds which have not arrived. Order has been misplaced and they will overnight to us to arrive by tomorrow. We hang out at the build site but only see the back of the house. The utility door at the back is white. I ask Crabby if that is the permanent color. He says we can paint it. I go through the paint swabs in the stack and we decide to give a pop of color to the house – it will be TEAL! Mom and dad flew in yesterday but I haven’t had a chance to see them. I see them at the new house today instead. Ryan and I are no longer allowed near the house. The network wants it to be a total surprise when we see it on reveal day, tomorrow. I check in on the garage screen doors. The order has also been misplaced and now they will not arrive until Friday, the day after the reveal. We drive around in John’s truck as he interviews us. More on how this house will be a tool to improve our relationship an our concerns in living tiny. We are both independent and have never lived with someone else. How will that work? Will it be claustrophobic. I wanted a big tiny house to grow into. I explain that to him. Even though it is small, it has big windows, garage doors and high ceilings to make it feel more spacious. I work with Zack on a project – he has found a bicycle in a dumpster and we sever, weld and piece together a bicycle crank that will lower and raise a pots and pans holder in the kitchen. I have never welded before and I look like a fireman in my gear. I dress like Zack – suspenders, green hat. And Zack gives me a matching shirt that smells like him. Stinky sweat! While Ryan and I are under the tent, Stefan and the crew carefully try to move the trailer into place next to the main house. They have to cut down tree branches and back up carefully as not to ruin the porch. The crew is excited for the drama is causes for the actual show. But Stefan is nervous. We drive around with John in the truck once again. Kori is lying down, hidden in the back seat and checking the monitors. I am nervous, anxious, excited. I can’t believe the day has arrived. I hope I love it. I’m sure I will. But I also am not big into surprises. I like control. But I trust these people implicitly and know they will do a good job. Onlookers and my family is all there watching us get out of the truck as John pulls up with me and Ryan. I turn to see the house and it is beyond anything I could have dreamed of. It is truly a show-stopper. It is even more stunning that I had pictured it being and I am in love! Mom and dad are also stunned by its beauty. And people are driving by giving thumbs up and honking. It is a piece of art. Truly. Crabby says the same thing and says it turned out way better than he had even imagined. The network and everyone else loves it. Ecovet furniture is set up on the huge deck and makes it look so inviting. Colorful flowers, bushes and shrubs line the raised porch so you can’t see underneath. We walk inside. Pure astonishment and what has been done. Allegra has decorated it with Howse furniture, art prints, rugs. She has staged it with flowers and it looks like it’s out of Architectural Digest. I begin to tear up. I can’t believe it is mine. This all started 2 months ago and it is completed. The kitchen is HUGE! Way bigger than kitchens in a NYC apartment. Black countertops, beautiful white tile. The living room fits a normal size couch with room to spare. 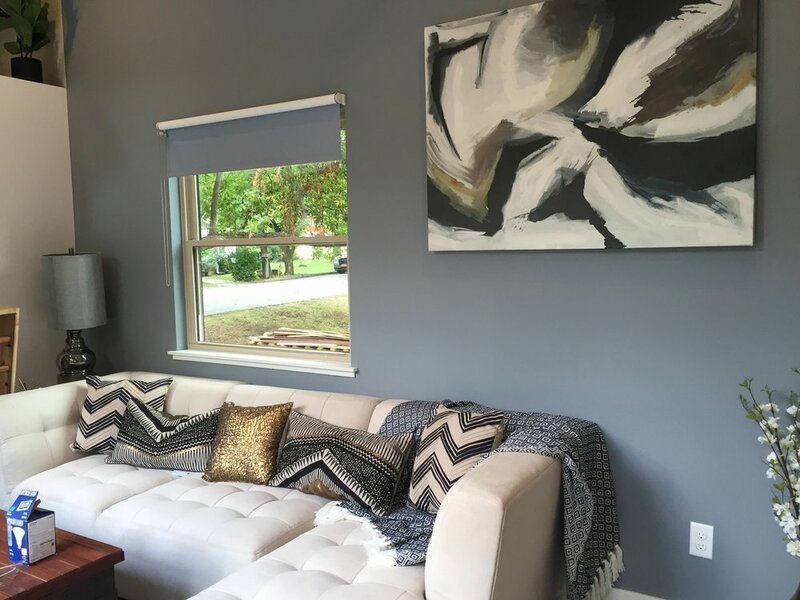 The wall behind the couch is accented with a blue paint to match the blinds. It is perfect. In every single way. The garage door to the house makes it seem so open. And the high ceilings make it seem grand and huge. Music trailer/recording space/guest bedroom. The inside is insulated with recycled denim. Zack shows me how the amp works. I plug in and me, Ryan, Zack and John stand in front of the speaker. Sound comes out of the huge amp. Zack has installed marine (boat) speakers that won't be affected by the weather. 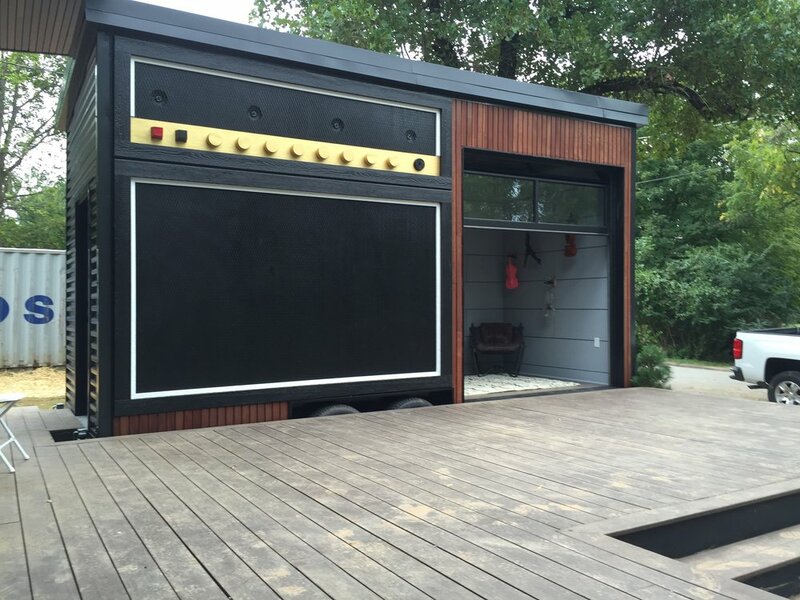 The speakers have been hung inside the amp and project out onto the porch. The porch is enormous and the perfect size for concerts. I play a distorted version of the Star Spangled Banner for the guys and we do a bit of head banging. Then Zack and John leave for their next project and Zack does a cartwheel off porch. It is pretty much the coolest thing I have ever seen in my life. So unusual. So much love put into it. So much planning and manifesting. We built the deck in front of the house to make it inviting. To make it a community piece. And it is just that. Everyone who walks by wants to check it out and see inside. It is a full moon today. The kids from the GT progam at Leverett Elementary School come over because they are doing a section on architecture. We explain different sections of the house to them. And we end by plugging the iphone to the amp, playing Kids bop music and having a dance party. The kids love the house – to them it is like a fort and Edmond wants to have his birthday party here. In the evening, we have an open house. Over 60 people come, some invited, some off the street. Many have been watching the progress and can’t wait to look inside. The general consensus is that it doesn’t seem tiny! 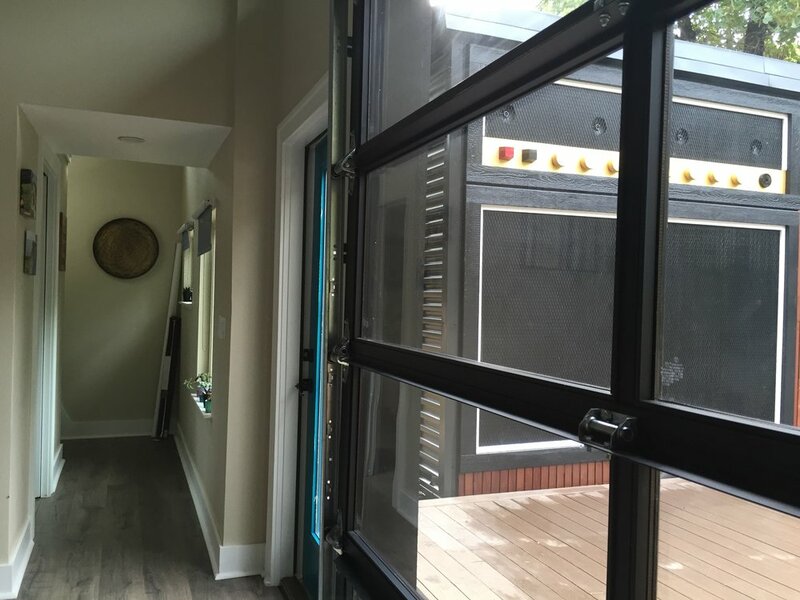 They love the unique features – bike crank, coffee table, massive garage doors, huge porch, functioning amp. I feel so proud. I have never wanted to invite people over before because I have never felt proud of where I lived and I have never actually fully moved in somewhere. I am always on the go, living out of suitcase. I have never invested in nice things because I know I won’t be there long. This feels more permanent. And makes me feel more settled. It has such wonderful energy and I am so excited to be part of this community. Sidewalk people from the city come over with their rulers and level and tools and tell us we can keep the 7th Ave sidewalk but need to build one in front of Willow side. It actually makes no sense to me. They are requiring me to build something on my private property for public use. And it will lead nowhere since the rest of the street hasn’t been built up yet. So I will be appealing it. The house is not totally completed and still has to pass inspection. We will need railings for the porch, loft, etc. At night the house is very exposed and I need to get curtains. But as I sit in my living room during the day, and I see people walk by or stop their cars to look, I invite them in. They are all excited to look around and are continually blown awayby the design, the openness and beauty of it. My first Halloween at the “Amplified” tiny house! I am now working on a Tiny Deck Concert Series – a take off on Tiny Desk concert Series on NPR. We will have weekly recorded concerts for Youtube to feature local musicians. Hopefully it will raise awareness of music in Fayetteville and potentially we can make it a new music destination like Austin or Nashville. We have our first concert with National Park Radio which is a local band from Arkansas. I jam with them on a couple songs. WE GOT THE CERTIFICATE OF OCCUPANCY TODAY!!! Met so many neighbors through this process who walk by and want to see inside. Met musicians, the house has such great energy and I think it’s because so much love went into making this house. I love living here!!! FOR MORE PICS SCROLL TO BOTTOM OF PAGE! Below is a list of vendors and people that helped make this possible! This past July, I was accepted by Tiny House Nation participate in their television show on the FYI network. I live in New York City, but have been visiting my brother, Z, his wife Gina and my two nephews Edmond and Clayton in Fayetteville a couple times a year. I have become increasingly excited by all of the energy of the area so when Tiny House Nation asked where I wanted to build my new house, the obvious answer was FAYETTEVILLE! During the process of building my tiny house, I have met so many friendly people – the construction crew building my house, my nephews’ teachers, people who work for the city, professors at the University, local musicians, my new neighbors – and the list goes on. It’s very different from NYC and I already love the community feel that this place has. I am thrilled to now be able to call it home. A special thanks to Brian Crabb (designer) and Zach who is an absolute genius and helped me throughout the entire process. And of course the entire production crew who we became friends with during our shoot. Below you’ll find some of the companies and people who have made this project possible. I am lucky to have my brother, Z Niederman, who has really made this house possible. Not only do him and his wife, Gina, run their own full time business, 3Volve Housing, Z has also been instrumental in helping me bring this house into existence. From running around getting permits to figuring out coding for a tiny house, he has been the point person for EVERYTHING on this project and I am beyond grateful to him. He is now an expert on tiny homes in Arkansas if you ever want to build one! They are also now building custom-made tiny houses and shipping them around the country for those who are interested. Z and Gina's company is called 3VOLVE Housing. They build and renovate houses in Northwest Arkansas. Currently they are focusing their efforts to develop South Fayetteville, near Walker Park, into a walkable neighborhood by building a combination of single family homes, multi-family units and versatile commercial spaces that cater to small businesses and pedestrian and bicycle traffic. They are always looking to partner with small business owners looking to grow their business in this community. Stefan Vickery and his crew are the men behind the house. They have worked tirelessly on this house on an insanely short timeline and I am so lucky they had time for this project. They have relocated to Fayetteville from Little Rock for the duration of this project and have built it from bottom to top with some help from locals. Stefan is actually part of my family – he is the brother of my sister-in-law, Gina Vickery so it was fun to be able to have this be such a family project. As a result of this experience, Z and Stefan now formed a company that builds tiny houses on trailers in Fayetteville. There are several models of houses which can be shipped anywhere in the US. Gina is not only my sister-in-law and friend from college, she has also been behind the scenes on this entire project, as host to Stefan and to me, and graciously allowing Z to spend a lot of time helping me with this project. Originally from Arkansas, she returned here after college. Through Z and Gina I have met so many interesting people, and feel welcomed by the community. If it were not for Gina, I would not be embarking on this big move! Ecovet furniture is a unique company that I have had the incredible privilege of working with. Their furniture is custom built by veterans using reclaimed material (largely from Walmart trailers). They design pieces for houses, companies, churches, bars, you name it. If you can think it up, they can design it. They also have signature designs you can find on their website. They have a beautiful showroom in Rogers if you ever want to check it out. You will see some examples of their furniture on my new deck! Howse has two locations, one in Bentonville, one in Little Rock. I was so excited to find this furniture store and meet Leslie. Not only do they have beautiful furniture but they have a free in-house design team that has been incredibly helpful! They have a wide variety of styles and have hundreds of one-of-a-kind items, next day delivery. 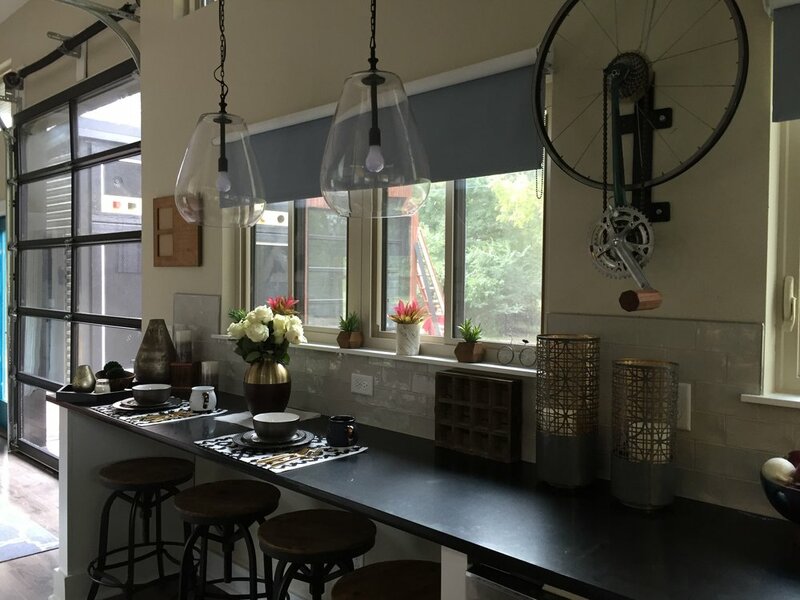 I fell in love with their furniture and was so thrilled to be able to use them to furnish my new tiny house. A couple days before filming began, we realized we didn’t have enough tiles for the bathroom. I ran to Townzen in a panic and met Nic Smith. From calming me down to helping me choose a tile that would go well with the color scheme, Nic was a lifesaver! And I am so grateful to him. He found something perfect that was in stock and that would match what we already have. Hovalin 3d Printed Violin is a project by my friends Matt and Kaitlyn Hova. It started out as a fun violin for Kaitlyn to perform on, but it turned into a potential way to save music programs. While music programs are systematically underfunded, and schools are receiving 3D printers through STEM grants, Kaitlyn and her husband saw this as a solution. Why not use these 3D printers to 3D print a school's music program? This is an opportunity that has never existed before, and it's exciting to see how this program will empower kids to continue to learn music and solve new problems through 3D printing. This is also called a viper violin. They are custom made by a friend in New York named Mark Wood. Violins are usually 4 strings but Mark has created a 6 and 7-string one as well, with FRETS! I first discovered the Green Goat food truck during my last trip to Fayetteville. I am a vegan and it is hard to find food when I travel. I was thrilled to have one of her vegan tacos which was AMAZING! But what was nice about Erin’s food truck is she caters to all types of eaters and the meat eaters I was with, were just as happy eating there. Delicious, comfort food that is made with love. You have to try one! She is parked here for the night, but her actual food truck will be parked around the corner on MLK Blvd. She also has another location where she serves unique sno-cone flavors (also insanely good! This yoga studio also has African drumming. The owners, Nee and Rob were kind enough to let the Tiny House Nation Camera crew into their studio to film, so you will have to watch for them on the episode which airs in March 2017. Angelo, the drum teacher and his crew all performed for the cameras and were a big hit! We really wanted to “dress up” the outside of the container storage area. Octavio was on board for paining murals and we are so excited he wanted to work with us. They are all for sale. And you can find more of his work at his web site. Olivia Trimble is an incredible local artist and paints custom outdoor signs around Fayetteville. You can find her on facebook. Her sign “Be Love” in front of the house was painted for us. 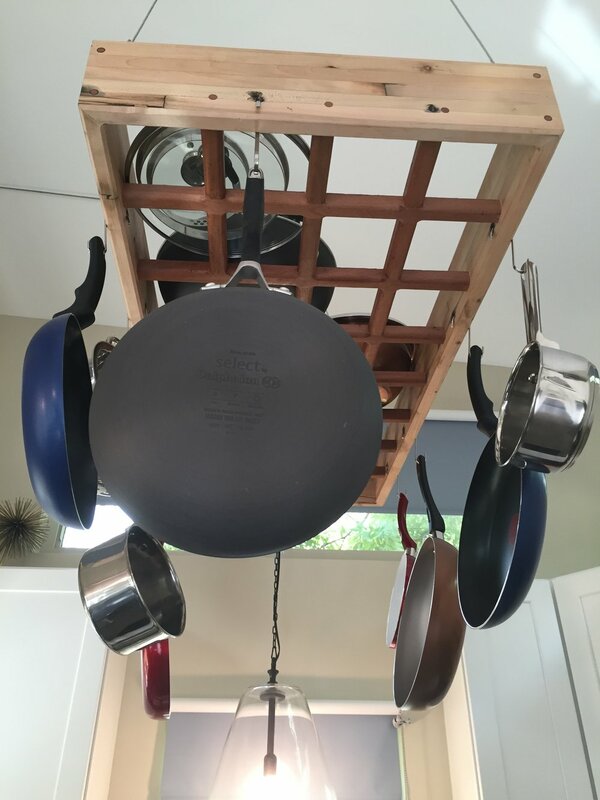 --Zack, the host, found a broken bike in the dumpster and used the spokes/gears to create a pulley system for pots and pans in the kitchen to raise it up and down. The wood of the holder above is from Ecovet. --We used alternating treads as stairs because of city rules – no stairs allowed in tiny houses! --The amp is a functioning amp. The speakers that face the deck are boat speakers so the rain doesn’t affect them. I can plug a guitar, electric violin or any instrument into the amp and it will play!